President Donald Trump has implemented tariffs on imported steel at 25% and aluminum imports at 10%. The tariffs that went into effect on March 23 are expected to have a far-reaching impact on prices all the way down the supply chain—and quickly. This may harm downstream manufacturers. Even if U.S. steel can be sourced, those prices are expected to rise now that the tariffs have taken effect, reflecting the shift to the supply-demand curve. Viking Plastics is a global supplier of engineered, injection molded and assembled sealing solutions headquartered in Northwest Pennsylvania. They offer custom products for the automotive, INDUSTRIAL and HVAC industries and expect to be impacted by the tariffs. U.S. steel makers will have increased pricing power as steel imports become more expensive. And because most aluminum is imported, costs will probably rise. According to Viking President & CEO Kelly Goodsel, manufacturers will have to mitigate the inevitable price increases from domestic suppliers as well. For value-added assembled products, Goodsel is bracing for short-term price increases. “In products where Viking Plastics molds and then assembles components, or manages supply chains, we are monitoring the situation very closely as the price of steel and aluminum supplied products we employ in our processes—brackets, inserts, bushings, etc.—all could see significant short-term increases,” he said. 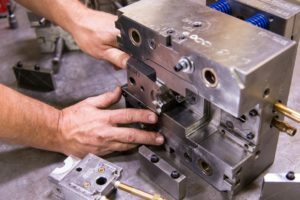 But Goodsel expects that the most direct and immediate impact by tariffs will be on injection molds, where as much as 75% of the cost could be the steel used in the mold base and inserts. He provides an example. “If a standard tool has $40,000 of steel costs, and there is a 25% tariff, we and our customers could see an almost immediate $10,000+ increase in costs,” he added. There will also be a considerable impact to our engineering department as customers request metal to plastic part conversion support. We do expect many customers will look for more cost-effective options to die casting and smaller steel brackets. The manufacturing industry will have to adjust, either by paying the extra cost for foreign suppliers or switching providers. Many large companies that buy a lot of steel and aluminum have long-term contracts that set the price in place, so it might be a while before they see a price increase. Smaller companies usually don’t have such contracts in place, so they tend to feel the effects sooner. Many such price increases from producers occurred March 23. The impacts on the downstream industries may occur over weeks or months. As far as Viking Plastics is concerned, Goodsel says they will do their best to mitigate any price increases.